$/€1,000 Free in New Player Welcome Bonuses! The Fortune Lounge Group is giving away three Las Vegas double prize packages to lucky players. All you need to do is play your favorite Microgaming games at Platinum Play Casino, and you will earn reward points. For every 100 reward points you earn, you will earn entry into the Las Vegas draw. In addition, each time you fill up the arrow and reach 100%, you will get the chance to scratch for an instant prize! The Platinum Play Casino loyalty rewards program is available to all players with real money accounts. Players collect loyalty points as they play, and can ultimately redeem these points for cash. Players can redeem their rewards when they reach 5,000 credits, and will receive one online casino credit for each 1,000 points earned. There are also VIP status levels, Silver, Gold, Platinum and Diamond, which help players to earn more rewards. All new members are given 2,500 loyalty points when they sign up. Players who download the Microgaming powered online casino software for the Platinum Play Casino have an excellent choice of over 450 casino games, including various reel slots, video slots, roulette, video poker, craps, keno, baccarat, blackjack, and scratch cards. There are a number of progressive slots, as well as other progressive jackpots, including progressive video poker and some progressive table games. Platinum Play online casino offers a number of languages, including English, German, French, Italian, Spanish, Portuguese, Greek, and Dutch. 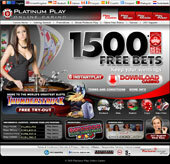 There are many options that players can choose in order to deposit and withdraw funds from the Platinum Play Online Casino. Currencies available are the €, the UK £, CA $, AU $, and US $. Credit/Debit Cards (Visa, Mastercard and Diners Club), Neteller, Ticket Premium, Click2Pay, Skrill, Eco Card, EntroPay, Clickandbuy, UKash, Paysafe Card, Instadebit, Direct Bank Transfer, e-check, POLi, Sofort, UseMyFunds, Transferencia, Neosurf, TeleIngreso, MultiBanco, Instant Bank, Instant Banking, WebMoney, Moneta.au Euteller, eWire, GiroPay, PostePay, and checks. Platinum Play Casino offers players the option to contact its helpdesk in all the usual ways, via telephone, email and live chat. There is an additional option that is also offered that allows players to contact the customer support team via Skype. Customer supports in English is available 24/7/365, and in other languages for more limited hours.